Now you can take iPhone calls right on your Mac. You can answer a call or dial a new one while your iPhone may be charging in another room or even buried in your backpack. Just point, click, and say hello. 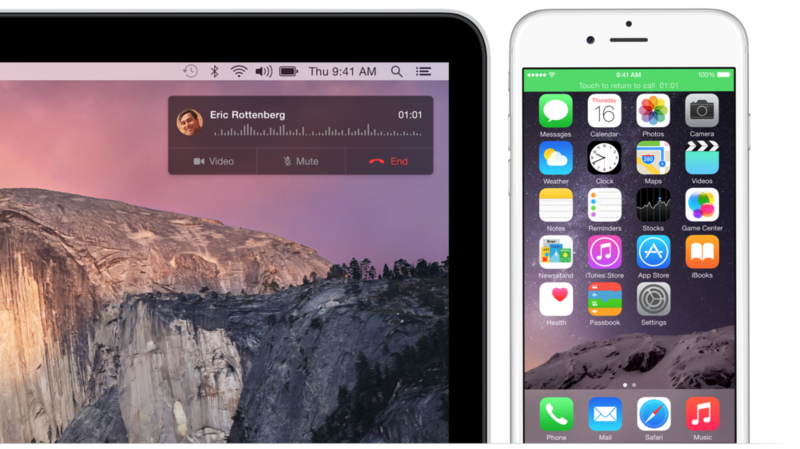 When a call comes to your iPhone, the call rings on your Mac. You’ll get a notification on your Mac showing you the caller’s name, number, and profile picture. You’ll also hear a ringtone — the same ringtone you have for that person on your iPhone. Click the notification to answer, and your Mac becomes a speakerphone, so you can have a phone conversation and work on your Mac at the same time. Making a phone call from your Mac is just as easy as you’d expect. You can click any phone number you see in Contacts, Calendar, Messages, Spotlight, or Safari. If you join a conference call directly from a Calendar event, your Mac enters the passcode for you. To start a call, you can access your iPhone call history in FaceTime, or just enter the digits yourself. Posted on October 21, 2014 by Kevin Allgaier and filed under How To, Mac.